Five years ago, when Netflix announced it has acquired Tiny Fey and Robert Carlock's new comedy Unbreakable Kimmy Schmidt from the NBC scrapheap (the series was developed for NBC, who passed on it after an entire season had been completed), I was suitably intrigued to see what Fey and Carlock had put together. Now, having seen the final six episodes of Unbreakable Kimmy Schmidt, I remain just as enchanted with the series as I was all those years ago when I was first introduced to Ellie Kemper's peppy Kimmy and the rest of the gang. Sure, the series never did quite figure out what to do with Carol Kane's Lillian (never strange enough to fall under the mantle of zaney, but too kooky to be grounded in reality- all while being the most "New York" character on television), but this final string of episodes brings out the best in the series, the writing, the performances, and the storytelling. With a half-hour comedy, it can be difficult to truly see much growth in characters. After all, most of a show's main comedy comes from relying on one character holding the "idiot ball"- making a mistake or doing something that drives the comedy and confusion for the remaining 20 minutes of the episode. 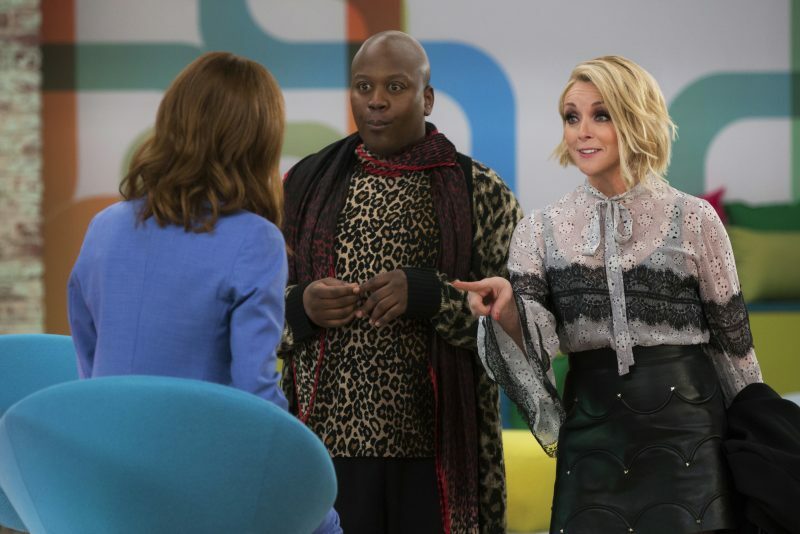 But Kimmy Schmidt managed to hit the sweet spot of having character growth baked into each episode's premise (and taking the characters on a journey over the course of the entire series- seriously, the final episode is full of moments that highlight how far each of the show's four main characters has come from season one). The show managed to make character matter without sacrificing the funny, as each episode was filled to the brim with sly, smart jokes. More than once while watching the final set of episodes, I had to pause the show because I was laughing too hard at a particularly apt bit. I can't wait to see what Fey and Carlock come up with next, because I already miss their particular brand of quick, deep-cut humor. So, Unbreakable Kimmy Schmidt remains the same show we've all loved until the bitter end. But what about these final six episodes? I'm happy to report that they are sterling as well, particularly an hour-long Sliding Doors-inspired episode that is the highlight of the season (and one of the finest episodes the series has ever put out). When Titus and Kimmy sit down to watch Sliding Doors, Titus wonders what would have happened to all of them if Kimmy hadn't gotten into the Reverand's van all those years ago. The results of that sideways universe are as different as one might expect, but the real joy of the episode is watching each actor get a chance to play against type. Anyone wondering if Kemper could handle a darker character can rest assured that she has the range to play pretty much anyone. Jane Krakowski gets a chance to delve into the vulnerabilities of Jacqueline (who, naturally, is in a very different situation in this reality), and proves that she still has the range she first displayed back on Ally McBeal. Carol Kane really shines in this episode (Lillian's arc is particularly inspired here), and Tituss Burgess is just great as this different version of Titus. But "Sliding Doors" isn't the only great episode of the batch of episodes. Jacqueline and Titus are each given standout episodes (Titus's includes a great, long Cats joke, which absolutely slayed, and, when coupled with the Cats takedowns over at Crazy Ex-Girlfriend this year has created quite the trend - because Cats is the absolute worst, don't @ me), and all our favorite guest stars return for a final bow (while the Reverand appears, in various forms, throughout the season, we never actually get to see Jon Hamm - which actually makes the appearances even funnier). There's even a continuation of the puppet "Me Too" storyline Titus found himself a victim of in the first half of the season (complete with a Ronan Farrow penned expose, with Ronan Farrow playing himself), and the culmination of the will-they/won't-they saga between Titus and Mikey (which gives Mike Carlson some great stuff to play as we learn a bit more about how Mikey has been faring since Titus opted not to chase him). It's a fitting final chapter to a hilarious series.